Loews Philadelphia, formerly a bank called the Philadelphia Savings Fund Society, was built in 1932 by architect George Howe. Reaching 33 stories high, it was the first skyscraper in the country. You can still see the initials PSFS lit up at night on the building. When the bank closed its doors in 1992, the building was left abandoned for the next five years. In 1997, it was purchased by the Loews Corporation. 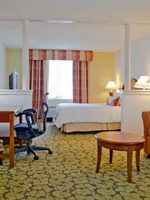 They decided to convert it to a 581 guestroom hotel, and have been welcoming families ever since. In 1976, the PSFS building was designated a National Historic Landmark. The owners kept many of the architectural details of this modern building, including the granite-faced base of the building and the limestone covered tower above, to the interior details, which included Cartier-designed clocks and custom designed furniture. 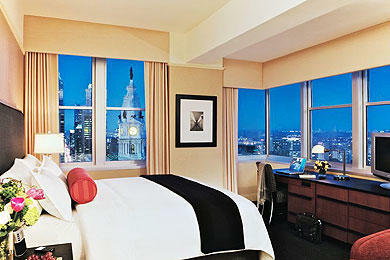 Today many rooms still have magnificent views of the Philadelphia skyline. Rooms with two double beds are recommended for families. If you need more space, you can rent two adjoining rooms. The hotel has port-a-cribs and rollaway beds, night lights for kids, a children's first aid kit, electric outlet guards, children's rain ponchos, strollers (which should be booked when you make your reservations), and child-sized blankets. A coffee maker, flat screen television and free Wi-Fi are available as well. Up to two children younger than 18 years of age sharing a room with parents stay free, when using existing bedding. I took my 8 year old twin boys for a quick trip to Philadelphia. The location was convenient and the parking amenities were great! The hotel is clean and the staff is friendly. It is a kid friendly hotel. Excellent stay at this hotel. Location is perfect; centrally downtown. I arrived with my dog and was pleasantly surprised by the warm greeting given both to me and my dog...they even presented my dog with a welcome gift full of presents! The room was large and comfortable. We did not try the restaurant or bar on the property. Valet was busy but when we called ahead for the car there was no issue. I highly recommend this hotel! Upon check-in to Loews Philadelphia, kids are welcomed with a toy. Playtime is emphasized at all Loews hotels. 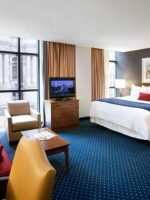 At Loews Philadelphia, there is a toy room where kids can borrow everything from hula hoops, jump ropes, educational books, coloring books and crayons, and more. All toys are age appropriate. For toddlers there are Little People videos and DVDs, Bounce & Spin toys, toy vacuums and mowers, toy musical instruments, and a wide assortment of cars, trains, and other toy vehicles. Teenagers are not overlooked. For the older children, there are Sony Play Station and Nintendo video games. In fact, the video game and DVD library is quite extensive. At Loews Hotels, teenagers receive a VIT (Very Important Teen) gift bag upon check-in. It's a Loews signature backpack that can be filled with an assortment of music and videos. The spa has manicures and pedicure treatments designed for teenagers, and the fitness room welcomes teenagers. An indoor lap pool is available for families to use. The pool is surrounded by lounge chairs and pool towels are provided. The lap pool is situated at the fitness center and geared more toward adults and teenagers, not little ones. We loved that Loews Philadelphia is so convenient to everything. Located at 12th and Market Streets, its central location is great for walking to the historic downtown area and to many restaurants and museums. 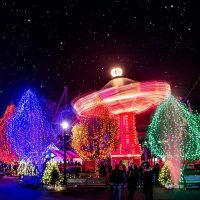 There is no organized children's program; but there is plenty to do in and around Philadelphia for the kids. It is a quick car, taxi, trolley, or bus ride to the Please Touch Museum and Franklin Institute -- both are excellent museums. Please Touch is geared to toddlers and kids up to age seven, while Franklin Institute is great for kids of all ages. We parked our car in the hotel garage and walked to most places in the city. Breakfast, lunch, and dinner are served here, an American-style restaurant right off the lobby. For breakfast, there is a buffet with pancakes, seasonal fresh fruit, waffles, and an assortment of cereals. The menu features frozen hot chocolate -- a family favorite -- chocolate milk, and eggs any style. The children's menu has boxed cereals served with fresh fruit, chocolate chip and plain pancakes, waffles, and eggs. 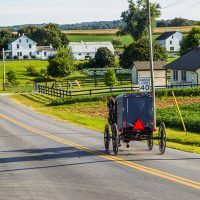 The regular menu is varied with eggs, scrapple (a local dish of pork, cornmeal, and flour that is served fried), bagels and lox, and pancakes. Breakfast is served seven days a week; but lunch is served on weekdays only between 11:30 a.m. and 2 p.m. You'll find everything from seafood soups to turkey sandwiches, grilled cheese, steaks, salads, and a large assortment of seafood. The crab cakes with crispy onions were delightful, even kids will love them. The Asian Tuna Caesar salad is a popular dish. It comes with spicy peanuts and shaved asiago, tofu, and Caesar dressing. Dinner features things like seafood, chicken, pork chops and beef. The hotel also has room service for breakfast, lunch, and dinner. 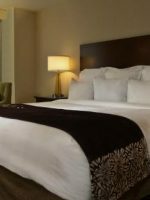 Loews has a wide range of packages, including those that include tickets to museums or historic sites. Loews Philadelphia runs many promotions with local area museums. For instance, you and your family can get VIP passes to local art exhibits. The VIP status allows guests to attend before the crowds or general admission. If you are potty training your child and forgot the portable potty, they have that too. Just ask, and the staff are happy to supply you with any items you may have forgotten at home. This includes toothpaste, toothbrushes, and other toiletries. We met a couple who borrowed the new Fisher Price Aquarium Bath Center for their infant. It's a sturdy and comfortable lounge seat that is placed in the tub to keep babies safe. At the end of the check-in counter of the hotel, is a silver plated doggie bowl and a cookie jar filled with dog bones. Dogs also get special treatment at all Loews Hotels. If you travel with your dog, a sticker will be placed on the outside of your room alerting staff that a pet is inside. This way your dog won't bolt when the door opens. If you are worried about your dog being alone in a strange hotel while you are out on the town, you can hire a pet sitter through the hotel. Pet sitting services usually runs an additional hourly fee. Loews also has doggie bowls and dog food on hand, just in case you forgot those items. The pet-sitting service works pretty much the same way as the babysitting. You have to book a day ahead. Babysitting services can be arranged by the hotel. Whether you want to share a drink with your spouse or go sightseeing without the kids, it's nice to have the option to hire a babysitter. The babysitter can stay in the room with your child or take the child outside to a museum or park. It's totally up to you. The fitness center is filled with an assortment of exercise equipment from stationary bicycles to stair masters and treadmills. While you are working out, you can watch the news or shows on the flat screen TVs. Philadelphia is a year round destination but is at its busiest with family travelers during the summer months. The winters can get cold in Philadelphia but also offers less crowds. 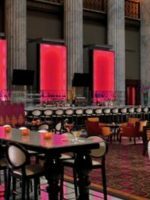 Loews Philadelphia is a 15-minute taxi ride from Philadelphia International Airport. A shuttle called Lady Liberty is also at the airport, and it goes to about a dozen hotels in Philadelphia including Loews. 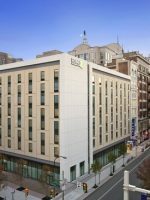 Loews is also a five-minute walk from the Amtrak 30th Street Train Station, and a two-hour drive from midtown Manhattan. Philadelphia is a very walkable city. Families can park, self or valet, at the hotel and walk or take taxis to explore the city. The spa and salon offers guests a wide range of spa treatments from his and her massages to facials, haircuts and styling, as well as manicures and pedicures.